This year rains started early Cangandala NP and access roads soon became so damaged, that from October onwards it became impossible to drive across the boundary into the park. In late September the animals seemed to be doing very well, with young Mercury proudly assuming his role as the new master bull of Cangandala. We were able to confirm 8 new calves born in 2013, the mothers being the 6 young females brought from Luando in 2011, and from Louise and Teresa, the two very old fertile cows that can’t stop breeding. If we exclude the 4 old cows that never calved, the fertility of the remaining cows is outstanding and pretty much at 100%. However, the calf mortality during first year often becomes a limiting factor for population growth. After September 2013 we couldn’t track properly calf development and success. By the end of the year it also seemed clear that we have permanently lost the two older bulls that had been the main protagonists in Cangandala for the past few years. There is no other large bull in the region and no serious wild predators, so I’m afraid that we have to conclude that [at least one bull] was poached, either shot or caught in a snare trap. The rainy season is when the fence is most vulnerable, but so far it seems that no sable has escaped, but on the other hand at least two new roan bulls have established themselves inside the sanctuary. This shouldn’t be surprising, as the roan population has apparently increased significantly in Cangandala, as proven by our remarkable trap camera record. We confirmed in the photographs a young mature bull and also a lonely yearling, in two different salt licks. The latter is yet another animal that, miraculously given his age and smaller size, survived a snare trap, showing an ugly scarred front leg. In 2012 and concerned with continuing hybridization risks, we castrated the young and only roan male inside the sanctuary as he had joined the sable cows. Now the situation has changed slightly and it is not realistic to keep tackling in such radical fashion every new roan invader. Especially because they will probably keep coming and more importantly the sable herds seem now properly supervised by young sable bulls. But we’ll keep watching… On the other hand and even if the one sable bull’s fate remains open to debate, the injuries on the new young roan prove that poaching with snares is still a major issue even in Cangandala NP. In Luando Reserve the 15 sable equipped with GPS collars are being tracked permanently and apparently are all safe. 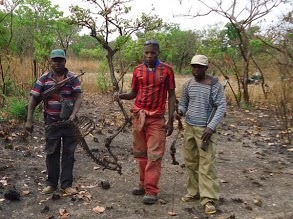 It seems clear that the most serious threat pending over the last surviving giant sable herds in Luando, are the snare traps planted around the majority of water holes, mainly concentrated between June and August, and aiming to capture by the leg any medium to large ungulate that attempts to approach the site to drink. This infamous technique seems to be causing huge and unsustainable annual mortality on giant sable. Particularly affected are the most vulnerable, such as breeding cows and young animals, and this is supported by our demographic data. Pregnant and recently calved cows are probably the most dependent on a constant water supply, while yearlings are trusting, adventurous and inexperienced, and many times lack the strength to escape a snare. Old bulls are more wary creatures, less dependent on water and much stronger. This may explain why the bull population in Luando seems to be in better shape than the female herds, and why so many females have serious leg injuries, and also why there seems to be an abnormally low annual recruitment of young animals into adult age, contrasting with healthy numbers of calves. We have devised and tested a new strategy, expected to producing results next season: we have acquired high resolution satellite imagery to pinpoint an accurate water network for the whole reserve; all water points were provisionally classified according to their nature, size and proximity to known sable territories or home ranges. We conducted a quad bike expedition in September for ground trothing, and fine tuning and further detailed classification of the most important water holes. By that time, most water holes had dried out, but the first right rains had started. Herds were not visiting the sites for drinking, and snare traps had already been removed. We able to evaluate the pre-identified water holes and to determine their importance and levels of threat. We visited 9 sites (of which only one was previously known by us). 2 water holes had limited water retaining capacity and were downscaled as unimportant. Of the remaining 7 sites, 6 had recent to not-too-old giant sable tracks. 4 sites had serious and clear poaching signs. In three water holes we found large poles that had been used during the last dry season, for snares targeting sable and other large antelope. In one of these sites there was a skeleton of a reedbuck. In the last site visited we surprised a poacher calmly drying up meat around the fire on a camp situated less than 200m from the water hole. He was alone as his other two mates had gone out to poach with shotguns. There were a few freshly killed duikers from the previous day, but we were even more alarmed to find that the two absent poachers had gone in pursuit of a giant sable bull that had visited the site during the night. This was easily concluded by the fresh tracks on the scene. The poacher was arrested and delivered to the local authorities, and his bounty burned. Upon interrogation he confessed that he lives in village situated more than 100km away, and they were a team of three and came in two bikes. The plan was shooting antelopes for a few days, drying up the meat and then take the product to Malanje and sell it in the market. Unfortunately and much to our shock and disappointment, we learned later, that our poacher escaped detention within 24 hours of being arrested and delivered… We now hope to establish network surveillance next dry season and this may, hopefully and for the first time in many years, help to start turning the tables in our favor in the fight against poaching. Another key milestone in this struggle is the renewed commitment from the FAA – Angolan Military Forces, who during October conducted a serious ground and aerial operation in Luando, aiming to serve as deterrent to poaching. For a few days they deployed teams patrolling the reserve, making local villagers aware of the importance to protect the giant sable, and sending the message that from now on, the military will be watchful to protect the national symbol. We collaborated with their initiative, and some awareness flyers and posters were produced and used. At the end of the operation no poachers had been caught but a clear statement was made. To see some of vaz Pinto’s photos go to this link.